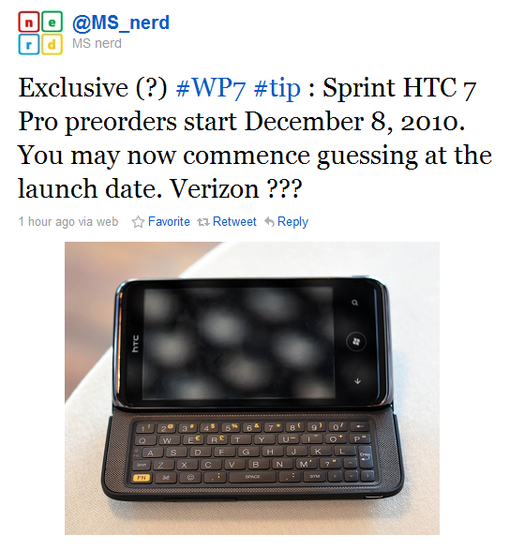 WPCentral is reporting the rumor that Sprint might be taking pre-orders for Windows Phone 7 before the end of the year. According to the whispers, starting December 8, Sprint will take pre-orders for the Sprint HTC 7 Pro, exactly one month after AT&T and T-Mobile begin selling their devices. This device recently passed through the FCC, would be the first CDMA devices we’ve seen on the fledgling mobile OS. Keep in mind that we’re not expecting CDMA WP7 handsets until 2011, so if this rumor proves to have legs, you might have to wait the better part of a month — or more — before you actually get to pick up the phone you pre-ordered. Not sure how much faith I put into this rumor. What company starts taking pre-orders weeks after Black Friday.